Regular readers know that these pages have featured some of the most exotic and costly systems. I certainly enjoy reviewing the best of the best, but now it is time for some perspective. 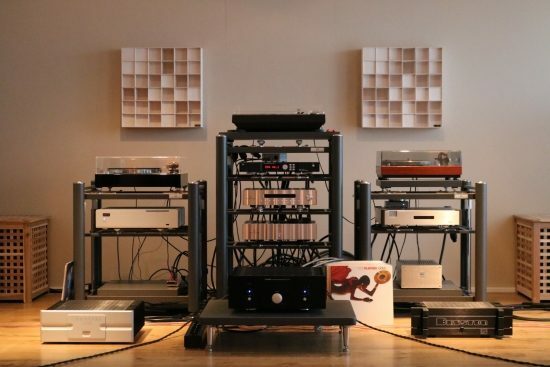 There are many music lovers without deep pockets but still a desire for high end equipment. What to do? As this is a speaker review, I will focus on speaker companies. 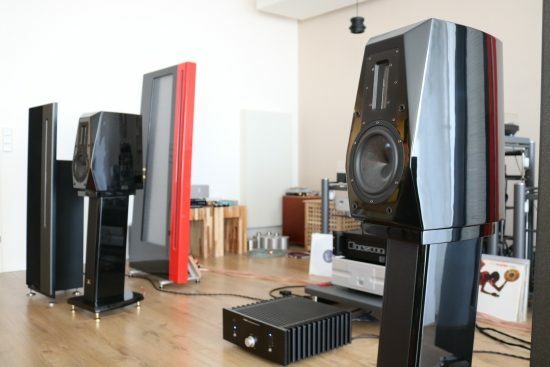 Of course there are the well-known brands such as B&W, Dali and Kef who manufacture high end products as well as very affordable ones. The entry level speakers of these brands are a safe choice because they usually perform very well considering the cost. But they are of course built to a price point and often this means that they are manufactured with cheaper materials and especially the cabinets do not look quite as impressive as the higher end offerings. What if one wants high end looks but without the high end price? One looks to China! Yup: that’s real leather on those stands! 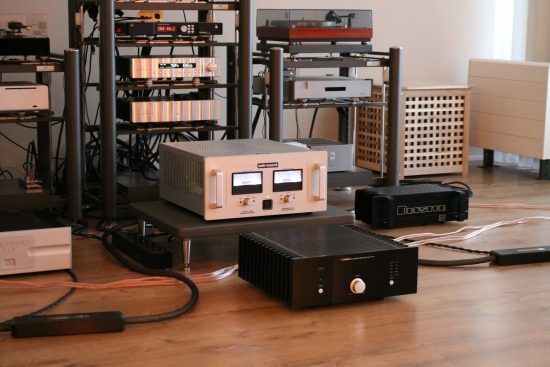 Jack Boelsz of Boelszaudio contacted me for reviewing two recently introduced products in his portfolio: the Xindak XA6950 II integrated amplifier and the Aurum Cantus V30M speakers. This review focuses on the latter. 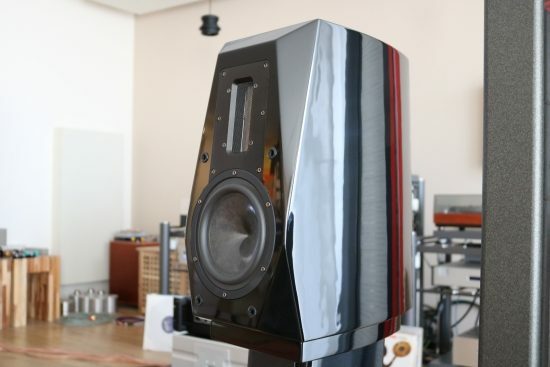 There are no two ways about it: the Aurum Cantus V30M’s really are beautiful. The review samples are finished in piano laquer but the speakers are also available in high gloss maple and rosewood. 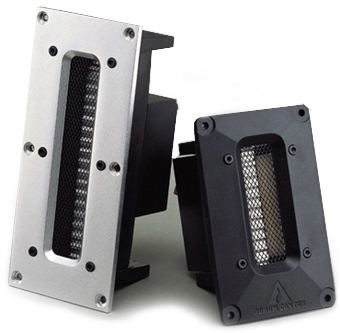 The speakers feature a pure aluminium ribbon tweeter for fast transient response and super low distortion and a carbon fiber and non-woven carbon fiber + cell material + non-woven carbon fiber sandwich woofer for low destortion and high power handling. Both drivers have been developed in house. Starting off with the Xindak XA6950 integrated amp fed by the Bricasti M1 DAC, the sound is powerful yet relaxed, with a gloriously rich midange and airy but very sweet and delicate treble. Listening longer it becomes clear that there is never any harshness, no matter which recording is played. The sound is just always sonorous and generous, easy going yet plenty powerful. 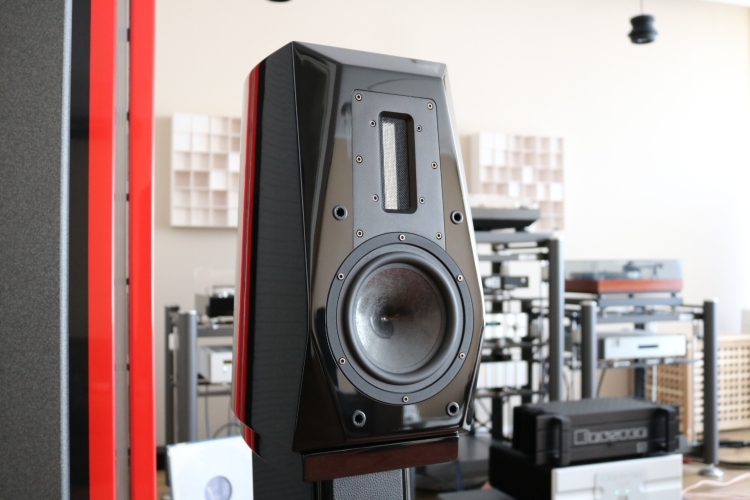 The Xindak XA6950 clearly has more than enough power to drive these speakers very very loudly, without ever hardening up or sounding forward. It’s quite amazing the amount of bass coming from these small speakers! It is a little thick compared to the free-flowing treble coming from the ribbon, and midrange timbre has a processed quality to it and is not as natural as I would like it to be, but otherwise the overall sound is quite enjoyable. Cross-comparing with the Xindak XA6950 connected to the Apogee Centaurs, I was expecting a much more open sound, because these speakers almost always sound a lot more open than other speakers, but this time the difference was not as large as expected. The Centaurs did have an overall cleaner, more transparent sound and much more linear bass, but quite surprisingly rather less of it, the Aurum Cantuses sounding quite a bit more full-bodied and sonorous, while retaining the kind of delicate and airy treble that only ribbons can produce. Timbre with the Xindak and the Apogees was still not as natural as I am used to from most other amplifiers, seemingly indicating that the amp was responsible for this. Retaining the amplification and switching back to the Aurum Cantuses, I am again greeted with very nicely solid bass, still a little thick, but more even handed, and very well behaved. The fuller tonality in the bass carries through in the midrange, lending more body to vocals and piano, making them sound more mature, and in some cases more convincing because of that. In other cases I felt that the midrange became slightly too muddled and not as open as I like it to be. Coming from full range ribbon speakers such as the Apogee Duettas this may come across as colouration and it probably is, but compared to many other dynamic speakers the V30M’s are actually very well damped and certainly have no obvious resonances. Being driven with amplification that I know well, and while detailing itself is never in question, I can conclude that focus and imaging in the depth plane (soundstage layering) is not quite as good as I am used to from the Apogees, but the Aurum Cantuses provide such a smooth and easy to listen to sound that this is quickly forgotten again. Naturally there’s more to this than just the quality of the drivers, but judging from the info on their website, Aurum Cantus certainly has not saved money on crossover design or the enclosure either. In any event, focus is quite good with voices being placed solidly in the middle while the other instruments are placed in a bubble around this. I now noticed that although the bass was fuller than it should be, it was very uniformly so, meaning that the woofer had very even output at all frequencies, even when reaching down below. 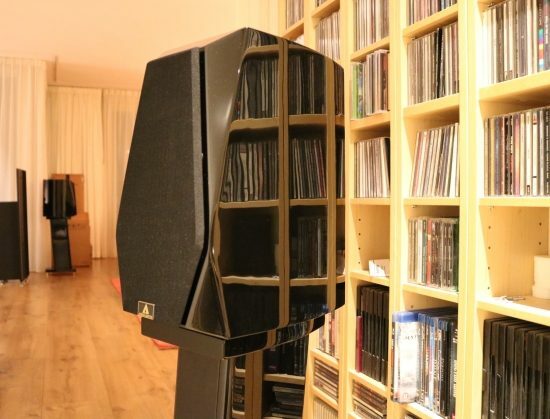 The upside of this bass fullness is that it has a tendency to make all music enjoyable while lending the impression that the speakers go lower than their physical dimensions allow. The manual states that the speakers extend to 40hz but does not specify how much dB the bass level is down at that frequency. My guesstimate would be that it easily betters the deep bass output of, say, a pair of B&W Nautilus 805’s. However I couldn’t shake the thought that perhaps the Brystons were not ideal partners for these speakers. I think they like clean and “fast” sounding amps. Alas I have sold my Jeff Rowland model sixes a little while ago because I am changing speakers and amplification, otherwise these would no doubt have been excellent partners. I only tried the speakers in single wire configuration, connected like this with Jorma no.3 speaker cable. Biwiring the speakers however could bring worthwhile improvements. To make sure that I have extracted the maximum from these speakers I asked my friend Jan Cramer to bring his Audio Research Reference 75 SE tube amplifier. 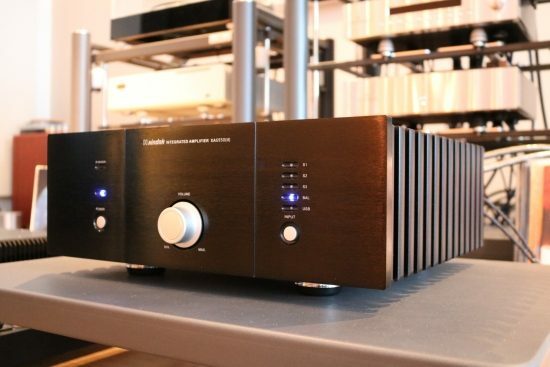 From earlier experience I already knew that this amp not only pairs exceedingly well with my Corus preamp, it also drives both the Centaurs and the Duettas splendidly. Just how a 75-watt tube amp is capable of doing that even more majestically than my trusty 150-watt Rowland model sixes I will probably never understand. 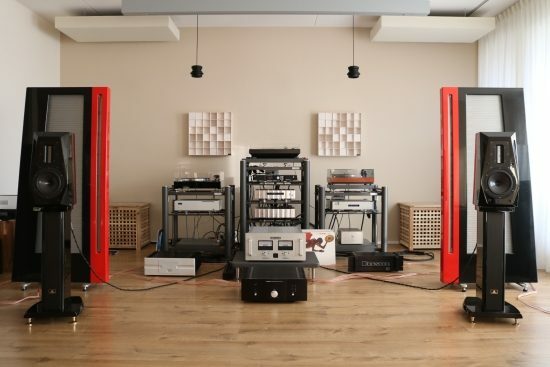 The Ref 75 SE performs miracles with the Apogee Centaurs as well as the Apogee Duettas. Naturally its 75 watts do not allow the Apogees to play very loudly but when listened to at moderate levels, the sound is pure magic. I figured that the Aurum Cantuses deserved being treated a little Ref 75 SE magic. Driven by the Reference 75 SE, the improvements were not as breathtaking as I had hoped, but evident nevertheless. 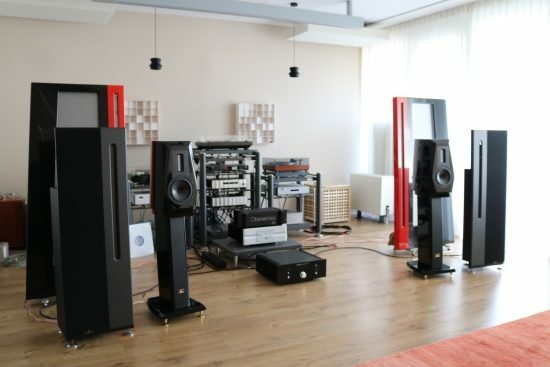 the Aurum Cantuses now had wider sound staging and an even more seductive, even more organic midrange. While these improvements were worthwhile, the performance as a whole was let down by a less punchy bass. 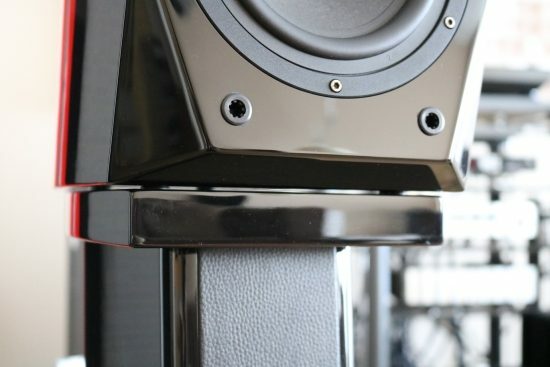 It seems that these speakers not only like clean sounding amps, but also likes them to have a firm grip. Despite its 40 watts, the Xindak does provide this grip indeed, but depending on listener preferences, this amp’s lush and warm midrange might be either the cherry on top of the cream, or altogether a bit too much. Even with the Reference 75 SE, there’s still that nagging feeling of a slight synthetic signature. The Xindak amp did indeed bring its own certain electronic signature with it but likely because of the slight congestion and reticence in the lower midrange, there is a hint of a synthetic nature in the speakers’ midrange too. In an effort to counter-balance this I also listened to the speakers using a Bryston 3B ST power amp. This amp is certainly much less refined than the 4B Cubed let alone the Xindak. I would even find it fair if some would call it somewhat PA-like in character, but in spite of its roughness and forward midrange so far it has always provided a very convincing lifelike tonality with all the speakers that I tried it with. And indeed, the Aurum Cantuses’ midrange were now nicely filled in, all but relieved from its restraint and becoming more lifelike in the process. Excusing the lack of resolution, the sound was now quite impressive. Even more so than before the speakers seemed to have enormous headroom and they could really jump out dynamically. Of course, quality is relative, but more money usually buys better equipment. But it will cost very serious money to better these beautiful monitors on all accounts. 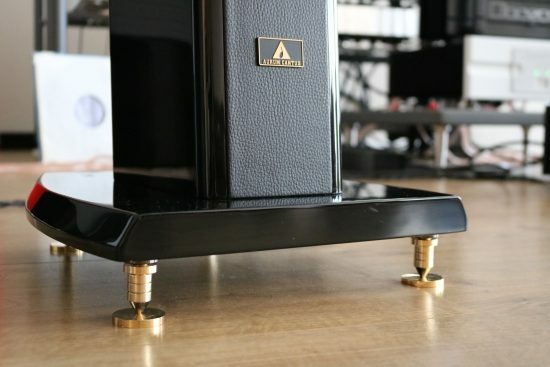 A speaker that springs to mind is the classy looking Monitor Audio PL-100. Also equipped with a ribbon tweeter, it has more natural timbre and a more transparent sound than the V30M’s, but this speaker is also twice as expensive. The PL-100’s may be more transparent, and more like the Centaurs in that respect, but ultimately, and this is the point I want to make, just like the Aurum Cantuses, the PL-100’s also had some colouration, in this case in the form of a wooly midbass. 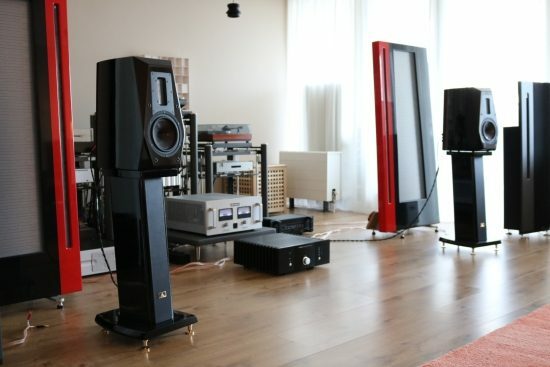 Coming from more than a decade of listening to full range ribbon speakers, I find that most dynamic speakers have less natural timbre as well as some colouration here or there so it is important to take this into consideration when trying to interpret my findings. I started this review by mentioning that affordable products usually do not have high end allure, but Aurum Cantus takes a good stab at rewriting these rules. 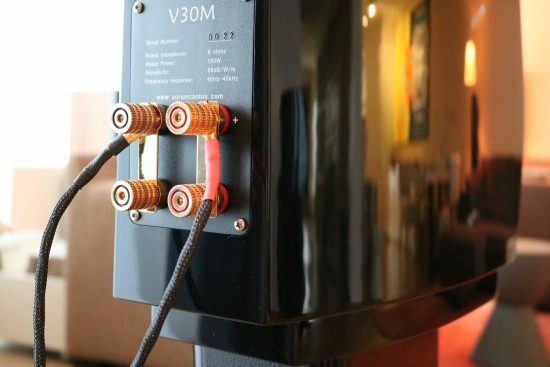 The V30Ms are beautifully sculpted and truly luxurious looking speakers indeed. They sound solid and assured, yet highly refined. Star of the show for me is the ribbon tweeter which sounds delicate and airy and well resolved. Surprising too is the amount of bass that these standmounts produce and inbetween is a warm and relaxed midrange. The V30M’s sound much larger than they are, and can play really loud too. Naturally one cannot expect reference class quality at this price level, but the V30Ms definitely perform well beyond their price level. The only aspect that I could find that could be improved is the somewhat processed and restrained-sounding midrange that in my view could be more lively, and more lifelike. Having lived with full range magnetostatics for over 10 years I have become quite sensitive to this aspect but many people might not be distracted by this too much, or at all. The plus side of these speakers’ smooth midrange is of course that they are less fussy about recording quality. We’ve moved and my listening has shrunk (3.6 x 5m). This could be a high value solution – though I wonder how it would cope with 30x push-pull watts from EL34 tubes? Good question. I did not have the PrimaLuna at that time so cannot really comment. The ARC Ref75SE did drive them but lacked propulsion in the bass. Now the Ref75 SE is not known for its beefy bass so your EL34 amp may have better bass but it is not very likely. I find that this is the thing more often with small speakers: they are often harder to drive properly than you would expect. Perhaps they need some solid state watts down below. That would be manageable. The bigger problem is finding somewhere to buy them, let alone listen to them! Hard to find in the West. You could ask the manufacturer if they distribute in your area. Or perhaps ask Boelszaudio if they deliver across the border. Made positive contact with Boelszaudio. Thanks.